I've always known that mackerel are susceptible to handling and unlikely to survive very long if they are held in hot sticky hands. Years ago, when I was working in an aquarium, it was easy to see which mackerel in the tanks had been touched on the mouth as they were unhooked. The lower jaws of these fish were always badly swollen. Anyway, I was reminded of the fragility of these little beauties this week. It looked like being a spell of fairly settled weather so I decided to go and see whether there were any mackerel, bass or pollack to be caught on the fly. I arrived at the rocks at about 04:00 and found that the sky was overcast and everything was pretty gloomy. I tried the fly for a while to no avail and then I decided I might as well spin. I started off with a big Redgill in hopes of bass but only missed a couple of plucks so I switched to a brand new wedge. This lure was armed with a razor sharp treble and cast like a rocket on the 22lb Nanofil line that I've been trying. 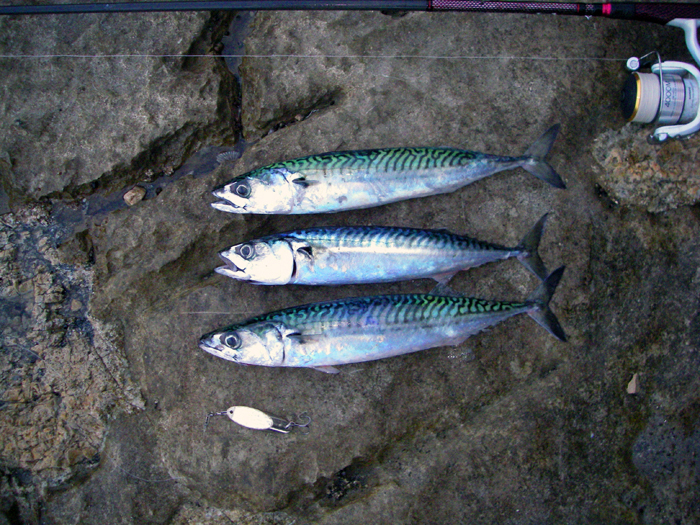 It wasn't long until I hooked a mackerel and in the next half hour or so I had seven more. They were all nice fish and the bigger ones (well over a pound) fought like tigers. In fact I thought for a while that the biggest one was a decent bass it scrapped so hard. I tried to shake the fish off the hook without touching them but three were so badly mangled by the treble hook that I kept them for future bait. Anyway - that was all I managed to catch. The following day I decided to have another go. This time I attached my old single (well sharpened) hooked wedge to the spinning rod and armed the slightly heavier popping rod with a big circle hook. 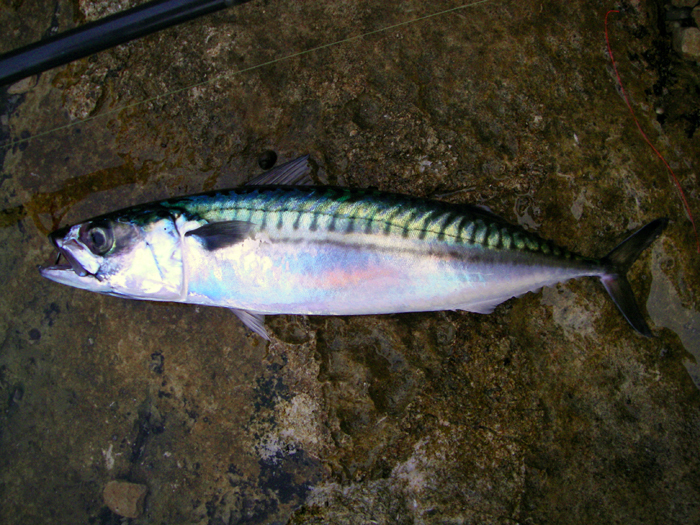 My intention was to try a mackerel livebait assuming I could catch one. 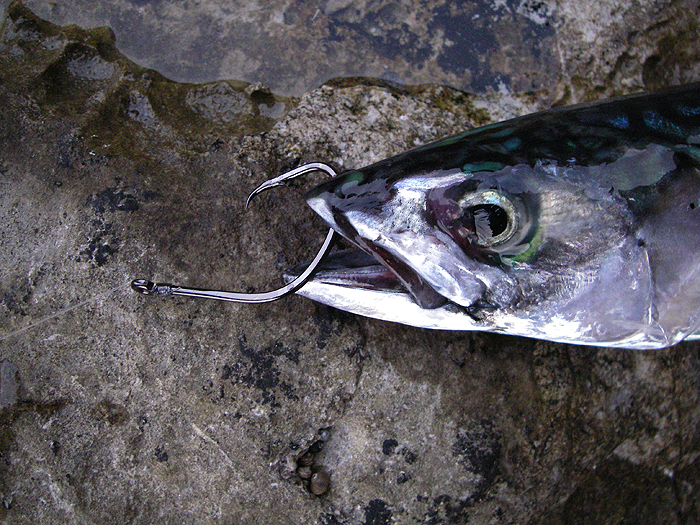 As on the previous day I hooked mackerel right on cue but the first two both dropped off the debarbed single and kicked their way back into the sea as I swung them in. Bugger! My next fish was a pollack - no good as bait for freelining as it would undoubtedly plunge into the kelp. 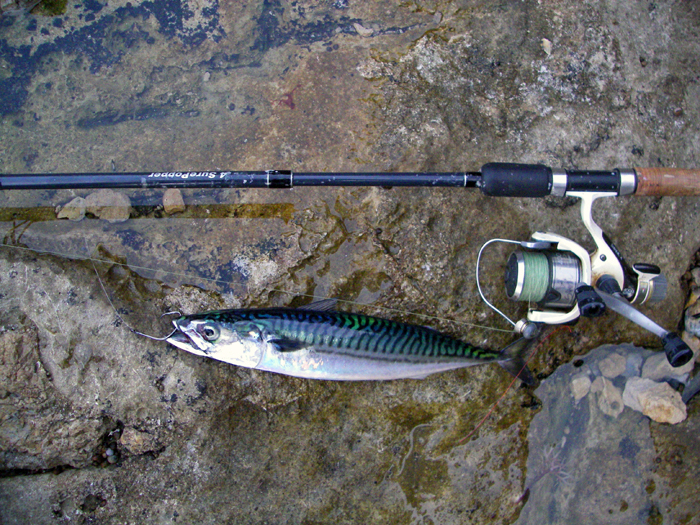 The third mackerel was landed and in my eagerness to transfer it to the livebait hook I dropped it onto the rocks. The fall was only about thirty centimetres but I then had to scrabble about to pick it up. Anyway, I progged the hook through its upper lip and set it swimming. Away it went but after only a few minutes it seemed pretty lifeless so I reeled in to find that it was stone dead. Clearly the trauma of being dropped had been a mortal blow. Out went the wedge again and soon I had another good mackerel. This one was carefully transferered to the livebait rod and it swam for the best part of an hour (unmolested by bass) until I packed in. An object lesson in looking after your baits properly.